Tri County Carpet and Flooring has been providing quality flooring for commercial and residential applications for over 40 years. Founded by Gene Vaughan in 1976 and now owned by his son Brian, Tri County is a family-owned business with a new showroom and warehouse facility that contains an extensive selection of all types of flooring by all popular brands which is professionally installed in a timely manner. “We encourage you to come visit us at our convenient location on Route 24 west in Fairbury where our staff is well experienced in helping you pick out the right floor for your room “, says Brian Vaughan, owner. We are an authorized Hoover vacuum dealer and carry all types of floor cleaning supplies to maintain your new floor. We carry many flooring installation tools and materials in stock and provide free in-home measurements at the customer’s convenience. Products include anything from cleaning supplies, vacuum cleaners, and flooring installation tools and materials, to equipment rentals such as carpet cleaners and floor buffers. Contact us about special discounts for contractors, new home and large volume orders. 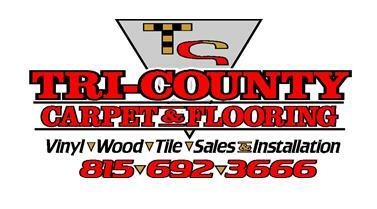 Tri County has a knowledgeable staff that is eager to assist you, and ensure that you leave with the perfect selection of flooring to fit all areas of your home. We have extensive information about all our products, and have staff members who have more than 30 years of experience. Our overall goal is to find flooring that will best fit your style, budget, and needs. Check us out today!